Some films perplex me, but for the wrong reasons. I have no questions about the plot of Hidden 3D, nor am I confused by anything proposed in the movie's storyline or twist ending. I'm really just perplexed as to why this film was made in the first place. It takes a great setting and an original (though silly) plot and then decides to coat it with terrible CGI (I can't tell if they thought that the 3D would help to mask it) and no violence whatsoever, though every character appears to be having the most horrific off-screen death. Most perplexing is that all of this was made for $8,000,000. Unless someone on IMDb misplaced a few zeroes, that leaves me more dumbfounded than ever. Just to clarify...that's eight million dollars for a film that boasts very sub-par CGI and no violence (so no budget was wasted on prosthetics or FX makeup). To further put this into perspective; Brad Anderson's Session 9 cost $1,500,000. His followup, The Machinist was budgeted around five mil. Both of these films are exceptional, high-quality works that feel bigger than their limited budget. So, someone please explain to me where all the money went in Hidden 3D, because if anything was hidden, it was the effort to make a full blown horror film. Brian Karter is still having nightmares from an event he witnessed as a child. His mother, who was a ground breaking scientist specializing in the field of addiction, used some less-than-practical methods to treat her patients. Leaving her legacy questioned as genius or murder, Brian has disowned her for a long time. Upon the news of her death, Brian learns that he has inherited the medical center where his mother originally worked and conducted her experiments. He wants to have nothing to do with it, but a greedy friend of his wants to renovate the massive church-like structure into a hotel and casino. 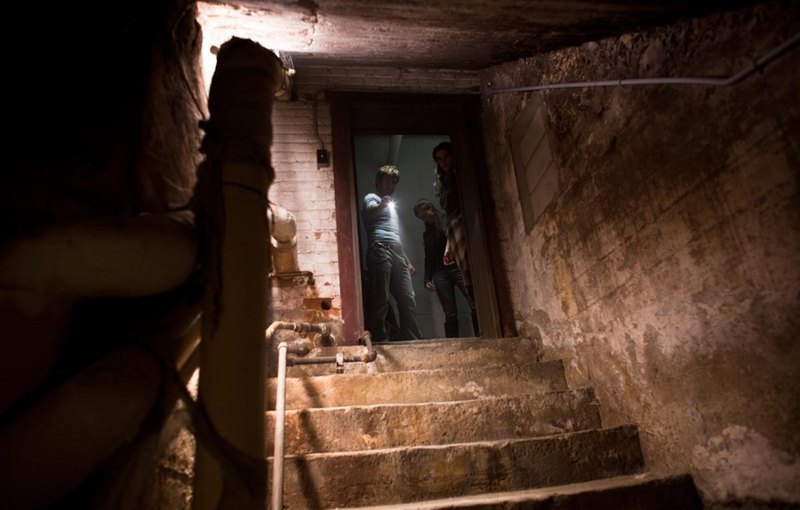 Urging Brian to at least check it out before writing it off, he assembles a team to investigate the building in order to see if it's worth the salvage, including an architect who is Brian's ex. 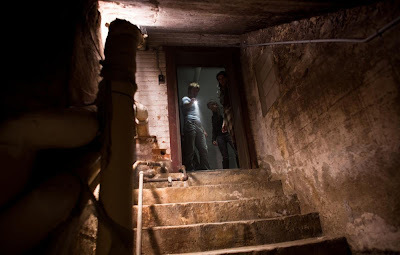 After they discover a hidden door inside of a confessional, the group follows a winding staircase to a secret underground lab where his mother's experiments were conducted. Soon, there are weird children killing off the gang while almost-cartoonish looking wasps pose an equal threat to their survival. 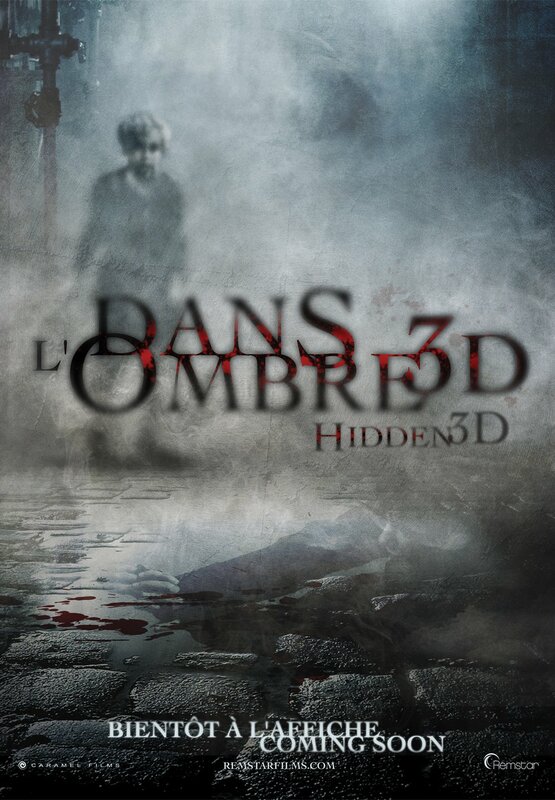 The main problem with Hidden 3D is that its plot twist could've been preceded by more tension and eerie discovery. Unfortunately, the movie is mostly people getting dragged off-screen to be killed, only to be found in mint condition with no blood or gore whatsoever. I'd actually rate this movie higher if it had least included some clever deaths, because every horror buff knows that when a kill happens off-screen, you can usually count on the finding of the body to reveal some sort of violent atrocity. Not in this film, as every discovery leads to a sleeping beauty of a death. The other (more obvious) problem is the horrid use of CGI in the film. The only real 3D elements on display are utilized for the wasps flying about. With or without the 3D effect, they look awful and amateurish, especially for a film boasting a semi-decent budget like this one. Anytime they're onscreen, the viewer is likely to be removed from any reality the film tried to mount, as you're constantly reminded that the nemeses of this film were made with MS Paint and a GIF animator (okay, so they're not that bad, but you get the point). The creepy children in the film also lose all credibility as being a menace as they also suffer from blurry, exaggerated facial contortion as seen previously (and only slightly better) in films like The Exorcism of Emily Rose. All in all, Hidden 3D suffers extensively from these major issues and it's disappointing because the location of the hospital is gorgeous and detailed, offering thick atmosphere to a film that just didn't want to use it. With uneventful kills and a payoff that loses its "umph" due to the eighty minutes that came before it, Hidden 3D should have never been found.